It is work to peel off the coating film. For the high price, I have time! There is hardness, it peels off the coating beautifully. This review is about item#34697713. This review is about item#34734716. The abrasive power of the same manufacturer, "Unilon Black", purchased at the home center was not too strong, not too weak to peel off the plating applied to the aluminum part of the motorcycle, it was just a good salted plum. The label of the product had a notation of "soft", the durability was low, but there was no clogging, the working efficiency was good as it was, but because it was hard to use depending on the place because it was a type with a plate attached to the back, the bevel I bought a type of this one. 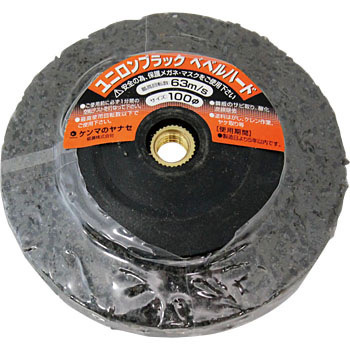 While this item is hard type and enhances durability, the first time it has a corner standing, polishing marks tend to become uneven, and as you use it clogs the polishing power decreases. When applying force to make up for it, the disc had some heat, and black traces remained as if the base material melted. Because it has good evaluation, it may be depending on the compatibility with the material to be polished, but it was not felt that it is very suitable for this application. We will not continue to purchase this product in the future, but I would like to try 3M company equivalent products although it is somewhat expensive. As a request for Mr. Monotarou, since the notation items and the like described on the product label are important information for selecting the product, I think that it is possible to be able to confirm with the image or the explanatory sentence as much as possible. What I was using before was somewhat expensive. I tried using this product to keep costs down, I was saved a lot as I used it before. Peel off the steel plate. It takes more time to peel off and peel off harder than 3M items. We also used other companies 'equivalent products at the same time, but the durability / polishing power of this product was several times higher than other companies' products. It was comfortable to use until it was about 5 cm in diameter. ○ I bought it because it was cheaper compared with M product. It becomes a sticky feeling with heat and the grinding power drops. Next time we plan to purchase the product of ○ M company.